Jan is looking to sell some furniture that she is shabby-chic’ing, and we need to know the costs of that. This ebay post is useful. So basically they take 10% plus any PayPal fee. You can do auction, Buy it now, Buy it now within auction, and you and set a minimum price. Help page on Buy It now. Help page on reserve price. 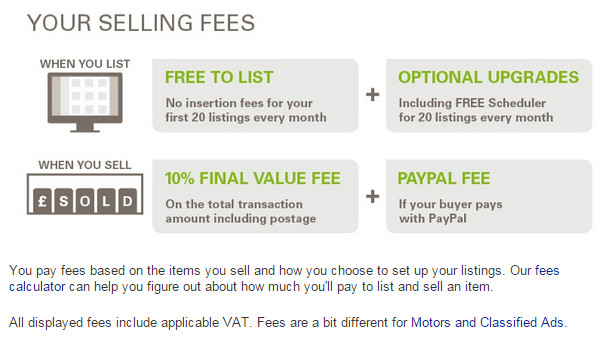 The fact you are selling on Ebay doesn’t influence the PayPal costs (Ebay own PayPal). So basically you are charged 3.4% for the average transaction, let’s say. That means the combined cost of Ebay and PayPal is about 13.5% of the sold value of your item. So if you sell something for £100 including postage, then they take £13.50 of that, leaving you with £86.50 (but bear in mind you have also lost out further because they took a cut of the postage).